While climate science has been a prominent concern of many university based researchers, these same venerable education institutions have failed to walk the talk in regard to applying climate change science to climate risk investment of their financial assets. 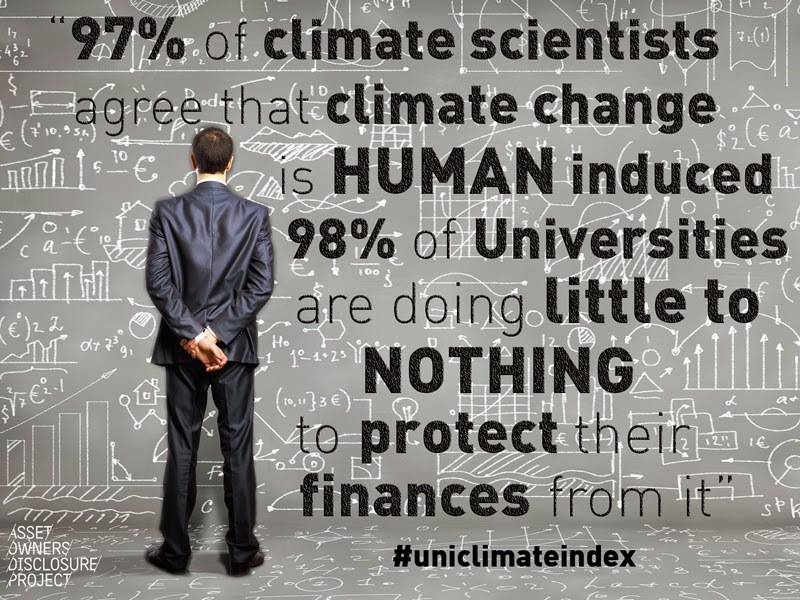 A new global survey of universities has found that the overwhelming majority are financially exposed to the risk of stranded assets and physical impacts of climate change. 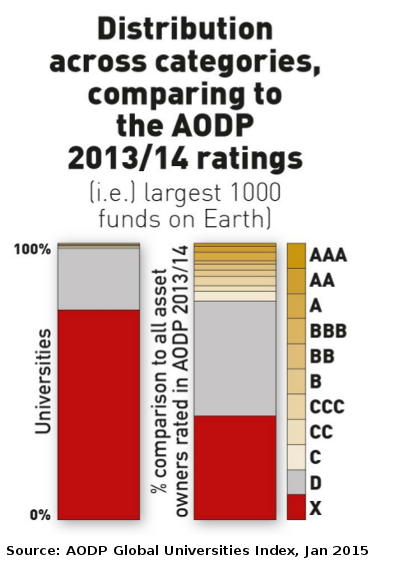 The global survey by the Asset Owners Disclosure Project was sent to 278 universities during the first half of 2014. Just six universities chose to formally respond to the survey. Research analysts then analysed public information on each university's climate risk investment policies and scored all universities according to policies and performance on: transparency, risk management, low-carbon investment, active ownership, and investment chain alignment. "This is the first survey in the world to look holistically at universities' endeavours to manage the systemic risks posed to their portfolios," said Dr John Hewson, Chair of the Asset Owners Disclosure Project. "It is shocking that universities - thought to be at the cutting edge of innovation and problem-solving - cannot grasp the simple mathematics of wasted capital and the need for more transparency in investing, not less," said Dr Hewson. The report found that 98% of universities are doing little to nothing about climate change risk in their investment portfolios, receiving a D or X grade. Over 75% of universities had no publicly available information on their websites regarding their climate risk management earning an X grade. D Grade is where climate change risk management is rated as poor, and X grade is where no information could be found to rate climate change risk processes at all. The report calls for all universities to be more transparent regarding their investment practices and decarbonisation strategies, especially as there is substantial interest from students, academics and alumni - all primary stakeholders - for this information to be available. The report authors state Trustees have a moral, if not a legal obligation, to ensure investment funds contribute to long-term sustainability of university operations. The survey methodology focussed on financial risks that climate change poses to asset owners' portfolios, as opposed to purely ethical investment decisions that simply screen for fossil fuels. Universities were rated not only on recent divestment decisions, but how those divestment plans are implemented successfully. Recent decisions by Stanford and Glasgow Universities on divestment were awarded few points as plans for implementation were required to score well. "The US-China deal and positive outcomes from the UN Climate Summit and COP20 indicate that the 2°C limit to global warming may be imposed. Universities, like any investor, must ensure that they are prepared for the stranded asset risk that this heralds," said Julian Poulter, Chief Executive Officer of the AODP. "Many of the universities that we have rated lead the world in academic rankings but are lagging well behind pension funds and insurers in managing climate risk," Mr Poulter said. The level of transparency and risk management compares very poorly with the AODP General index of the world's 1000 largest asset owners, where close to 80 percent of asset owners scored were either rated D or X. 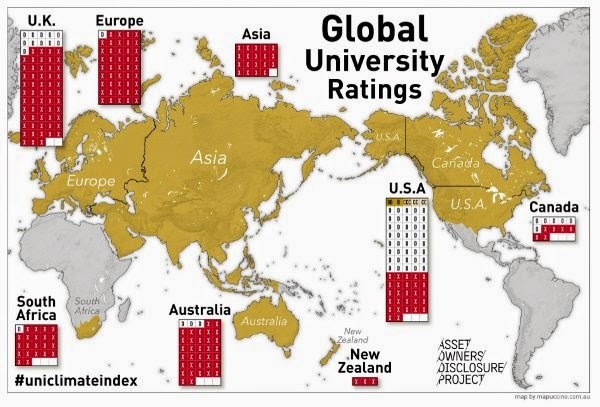 Indeed, no university scored higher than a BB rating, and the United States was the only country to have universities rated above D.
"Universities are clearly lagging behind the three other main classes of asset owners; pension funds, insurers and sovereign wealth funds. Globally, the sector has a long road ahead to catch up to the leading asset owners in managing this risk." said the report. At the top of the list, with a BB grade, was the University of California which "succeeded due to its strong active ownership program and a concerted effort through training and policy development to increase the University's capacity to deal with climate risk." said the report.
.@UC_Newsroom Thanks for disclosing for #uniclimateindex & congratulations on first place. UC well on its way to good #climate risk mgmt. Unity College, Green Mountain College, Sterling College and College of the Atlantic followed in the top five due to their having completed divestment from the largest 200 coal, oil and gas companies. Most US universities with a D rating received this due to being signatories to the American College and University Presidents' Climate Commitment. Some of the prominent universities that failed to rank at all due to no publicly available information regarding their decarbonisation processes and the management of climate change risk include: Princeton, Northwestern, John Hopkins, the Massachusetts Institute of Technology and the University of Michigan. All of Canada's universities were rated D or X. The UK also rated poorly with only 11 universities scoring a D rating, mostly for active ownership through proxy voting and engagement policies. The majority of UK universities were graded as X, including Cambridge, University of London and London School of Economics. "Oxford University, Cambridge University, the London School of Economics, University College London - their academics are leading the discussion on climate change, risk and stranded assets, yet none of the universities have a plan to safeguard their finances," said Dr Hewson. In South Africa Stellenbosch University was the only university to respond and the only university to receive a D grade for their proxy voting policies. The Netherlands Maastricht University was the only European university to respond and the only European university to receive a D grade. All Asian universities failed to repond and all had no public information on climate risk management policies and so were all given an X grade. Only 3 Australian universities recieved a D rating, with the rest rated as X. Charles Sturt University was one of the six to formally respond to the questionnaire demonstrating a basic level of transparency. The University of Sydney recieved a D for it's proxy voting policy. The Australian National University received a D for incorporating climate change into its socially responsible investment policy, but with no points awarded for it's recent decision to divest from a number of oil and gas companies as it was not clear this divestment decision was made for climate risk management. While Monash University may market itself as a 'Green' University with it's Monash Sustainability Institute, when it comes to climate risk investment it has decided to be entirely opaque. "Far from just fulfilling the cliché of being ivory towers, the universities' reluctance to disclose has revealed a fortress mentality." the report says in general about reticence in responding to the survey. "Despite escalating divestment campaigns on hundreds of campuses worldwide, this sustained stakeholder pressure has not always led to a more transparent discourse on the risks of climate change." John Connor, CEO of The Climate Institute, said in a media statement: “It’s unacceptable that the university sector, which plays a leading role in advancing our economy and society, is so far behind on this critical investment issue. Many Australian universities are pioneers in climate change research, so these institutions should be well aware of the unique risks to investments posed by the potential impacts of climate change itself, and the regulations that will inevitably ramp up to stave off those impacts.” he said. Connor also stressed that this ranking looks past recent in principle decisions by university trustees and focuses on the actions of managing and implementing climate risk. “Some recent commitments from universities are welcome, but they’re not enough.” he said. The Asset Owners Disclosure Project was established by Dr John Hewson, an Australian Professor of Economics and a former leader of the conservative Liberal Party of Australia, with the assistance of the Climate Institute. In 2014 he spoke at the Sydney Festival of Dangerous Ideas how Your Superannuation is destroying the planet. He has also been highly critical of Prime Minister Tony Abbott who he employed as one of his political staffers when he was parliamentary leader of the Liberal Party and Leader of the Opposition in the early 1990s. "We need leadership to challenge the scare campaign that's been led by one of my ex-staff members," he said to a World Environment Day climate rally in Canberra in 2011.